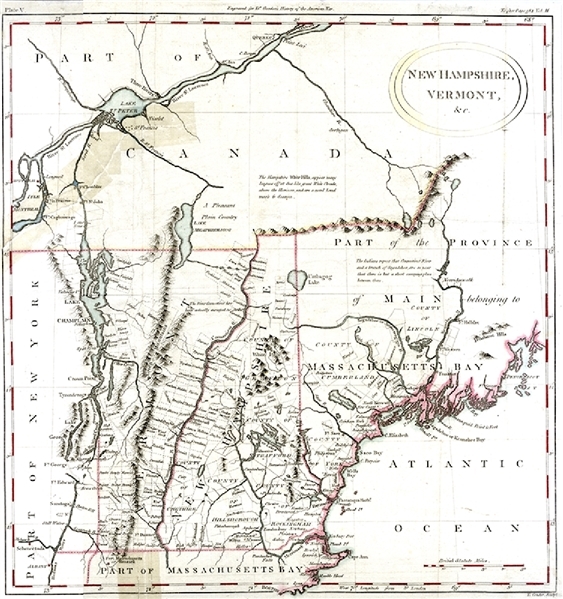 Map, 14” x 13-1/2”, hand tinted, titled : New Hampshire, Vermont, &c; Engraved for Dr. Gordon’s History of the American War,” London , 1788, Tape repair from the reverse side, else fine. Interesting and detailed map of most of New England. Shows Counties, townships, towns, forts, rivers, lakes, etc. Maine is listed as Part of the District of Main belonging to Massachusetts Bay. Various notes describe the White Hills, the limits of the Survey of the Connecticut River and other interesting colonial information. From Dr. Gordon's History of the American War. Engraved by Thomas Conder. Unsually nice example. Only one appearance in the a dealer catalogue in the past 25 years.